Round 3 at a YCS means that our Very Important Players now enter the fray after their 2 Round Bye. 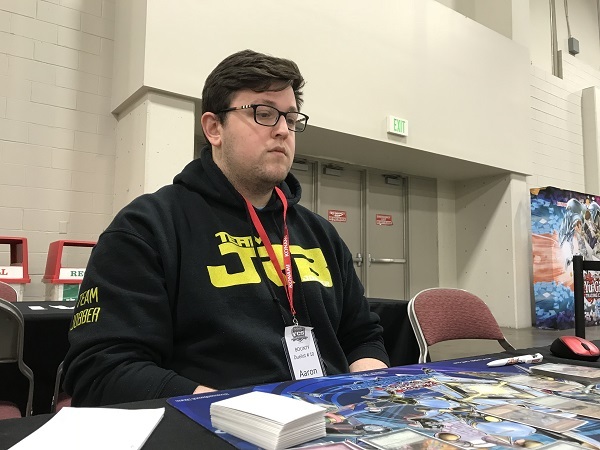 Our only VIP Duelist in attendance this weekend is Ultimate Duelist Series Champion Aaron Furman from Linwood, New Jersey. 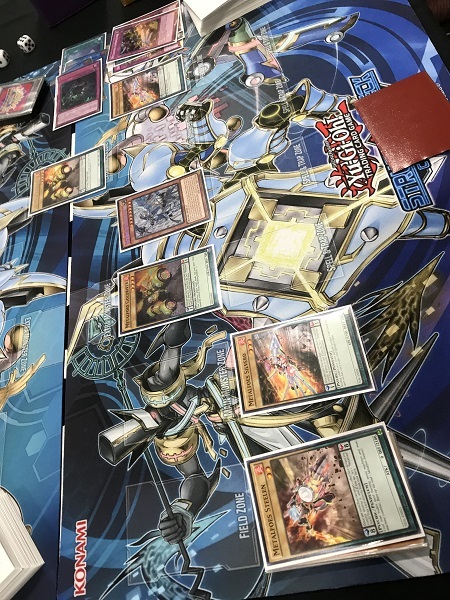 His Deck is Metalfoes True Draco, a strategy we’ve seen here and there that is a strong pick for this weekend’s tournament. His first opponent of the day comes from across the pond! Darren Stephenson from Newcastle, UK has a Pendulum Magician Deck. It’s time to Duel! Stephenson won the roll and elected to go first. He started off with Mythical Beast Master Cerberus and used the effect to destroy itself to add Mythical Beast Jackal King from Deck to hand. He then activated Jackal King and used the effect to destroy itself to Special Summon Mythical Beast Master Cerberus from the Extra Deck. He then Normal Summoned Rescue Hamster and used the 2 monsters to Link Summon Heavymetalfoes Electrumite! He used the effect to send Astrograph Sorcerer from the Deck to the Extra Deck. He then activated Harmonizing Magician and used Heavymetalfoes Electrumite’s effect to destroy Harmonizing Magician and add Astrograph Sorcerer back to his hand. He used his Astrograph Sorcerer’s effect to have it Special Summon itself and added another Harmonizing Magician from his Deck to his hand. He then drew a card for Heavymetalfoes Electrumite’s other effect. He passed there. Furman had a hand of Master Peace, the True Dracoslaying King; 2 Astrograph Sorcerers; Metalfoes Steelen; and Metalfoes Silverd. He drew Terraforming. He activated Metalfoes Silverd and Metalfoes Steelen to the Pendulum Zones. He then used Metalfoes Steelen to destroy Silverd and set Metalfoes Combination from the Deck. He then activated Astrograph Sorcerer in his hand, Special Summoning it and adding another Silverd from his Deck to his hand. Furman then activated Terraforming, but Stephenson negated it with Ash Blossom & Joyous Spring. Furman then activated Silverd, used its effect to destroy Steelen, and Set another Metalfoes Combination. This allowed Furman to use the second Astrograph Sorcerer, Special Summoning it and adding another Steelen from Deck to hand. He Tributed both Metalfoes Combinations to Tribute Summon Master Peace, the True Dracoslaying King! 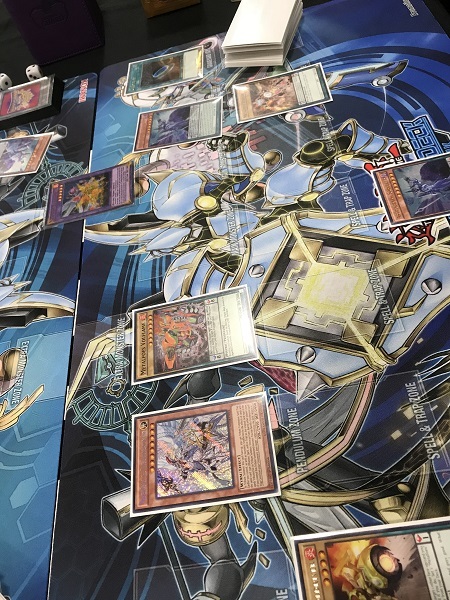 He used the effects of the Combinations to add a Metalfoes Volflame and a Metalfoes Goldriver from Deck to hand. He activated Steelen and used the effect to destroy Silverd and Set Metalfoes Fusion from the Deck. 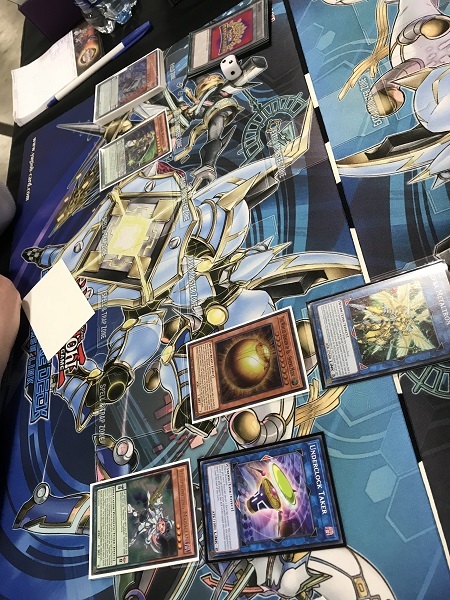 He then activated Metalfoes Goldriver, then Pendulum Summoned Metalfoes Volflame from his hand and a Silverd from the Extra Deck. He then activated Metalfoes Fusion, sending Silverd and Astrograph Sorcerer back to the Extra Deck to Fusion Summon Metalfoes Mithrilium! He used Metalfoes Fusion’s effect to shuffle it back into the Deck and draw a card (another Astrograph Sorcerer). Furman then activated Metalfoes Mithrilium’s effect, sending back both Metalfoes Combinations from his Graveyard to his Deck to bounce Stephenson’s Heavymetalfoes Electrumite back to his Extra Deck. He then used Goldriver’s effect to try to destroy Steelen, but Stephenson Chained Ghost Ogre & Snow Rabbit to destroy the Goldriver and prevent the effect from resolving. Furman activated the Astrograph Sorcerer in his hand and that was enough for the concession. 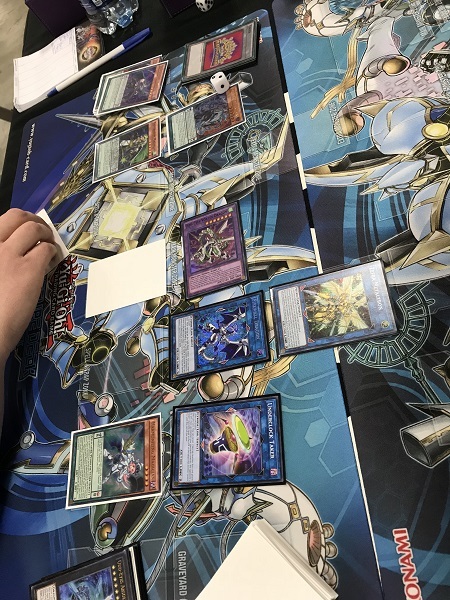 Furman drew for turn and started with a hand of 2 copies of True Draco Heritage, Rescue Hamster, The Winged Dragon of Ra – Sphere Mode, Metalfoes Volflame, and Metalfoes Steelen. He Tributed Stephenson’s Firewall Dragon, Odd-Eyes Vortex Dragon and Mythical Beast Jackal King to Tribute Summon The Winged Dragon of Ra – Sphere Mode to Stephenson’s side of the field! He then activated Silverd followed by one copy of Heritage! He used Silverd’s effect to destroy Heritage and set Metalfoes Combination from the Deck. He used Heritage’s effect to destroy the face-down Dimensional Barrier, which Stephenson Chained declaring Pendulum. Furman had no answer to that and elected to concede and go to the third Duel. Furman elected to go first. He started with a hand of Master Peace, the True Dracoslaying King; True King’s Return; Dimensional Barrier; True Draco Heritage; and Metalfoes Goldriver. His first play was Setting all of the Spells and Traps before passing. Stephenson started with Abyss Actor – Curtain Raiser and used the effect to have it Special Summon itself, but Furman Chained Dimensional Barrier declaring Pendulums, stranding Abyss Actor – Curtain Raiser in the Pendulum Zone. Furman drew Terraforming and activated it, but Stephenson Chained Ash Blossom & Joyous Spring to negate it. He passed. Furman drew Metalfoes Steelen. He activated it in the Pendulum Zone then flipped up the face-down True Draco Heritage. He used the effect of Steelen to destroy Heritage and Set Metalfoes Combination from the Deck. He then used Heritage’s effect to destroy Stephenson’s Abyss Actor – Curtain Raiser. Furman then activated Metalfoes Goldriver and tried to use the effect to destroy Metalfoes Steelen, but Stephenson Chained Ghost Ogre to destroy it. Stephenson drew for turn and activated Mythical Beast Master Cerberus in the Pendulum Zone and used the effect to destroy it and add Mythical Beast Jackal King from his Deck to his hand. He then activated Jackal King and used the effect to destroy it to Special Summon Mythical Beast Master Cerberus from the Extra Deck. He then Normal Summoned Rescue Hamster. He used the effect, Tributing it to Special Summon 2 more copies of Abyss Actor – Curtain Raiser from the Deck. He used an Abyss Actor – Curtain Raiser and Mythical Beast Master Cerberus to Link Summon Heavymetalfoes Electrumite! Its effect sent Astrograph Sorcerer from the Deck to the Extra Deck. He then activated Black Fang Magician, but Furman Chained True King’s Return, using its effect to Tribute it and the face-down Metalfoes Combination to Tribute Summon Master Peace, the True Dracoslaying King! True King’s Return’s effect destroyed Heavymetalfoes Electrumite while Metalfoes Combination searched for Metalfoes Silverd. Stephenson proceeded to use Black Fang Magician’s effect to have it destroy itself and halve Master Peace’s ATK. Abyss Actor – Curtain Raiser tried to declare an attack on Master Peace but Furman used Master Peace’s effect to destroy Curtain Raiser. Furman drew Silverd for turn. He activated it, then Pendulum Summoned a Goldriver from the Extra Deck and a Silverd from his hand. Stephenson then activated Ghost Reaper & Winter Cherries, revealing Heavymetalfoes Electrumite, forcing Furman to banish both of his copies. Furman continued by using Silverd to destroy Steelen to set Metalfoes Combination from the Deck, then Master Peace destroyed Furman’s own Combination allowing Furman to add Metalfoes Goldriver from his Deck to his hand. He Normal Summoned it, and that was enough Attack Points to end the Match! Aaron Furman takes his first win of the day, advancing with a record of 3-0! 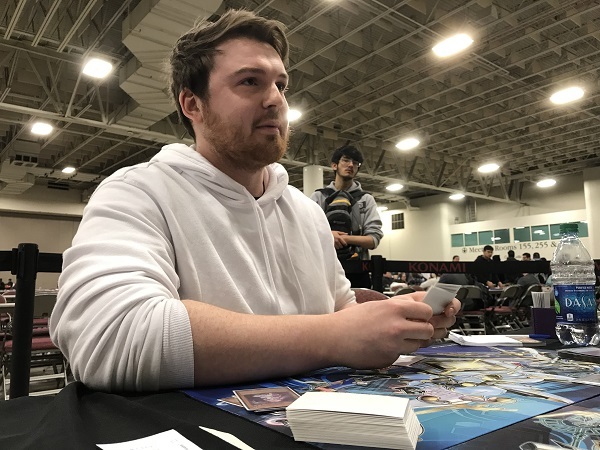 YCS Salt Lake City: Standings After Round 4 YCS Salt Lake City: ATTACK OF THE GIANT CARDS! !